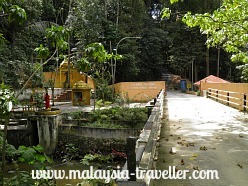 Commonwealth Forest Park is located at Bukit Lagong Forest Reserve on the road to Rawang, about 23km north of Kuala Lumpur. 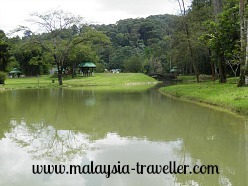 It is a large forest reserve of over 600 hectares of lowland dipterocarp species bordering Kanching Recreational Forest and backing on to Forest Research Institute of Malaysia (FRIM). These three forested areas together form a large green lung on the northern edge of the city and let's hope they remain pristine because development is nibbling at their edges. This park was established in 1993 to mark the 14th Commonwealth Forest Conference. 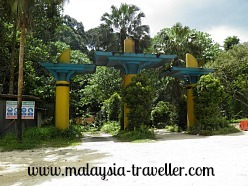 Then for a while the park fell into disrepair until a firm called Future World Avenue Sdn Bhd took over management of a 260 hectare portion of the park which is now branded as Commonwealth Forest Park & Resort. They are geared more towards large groups for teambuilding events, seminars and so on but they can accommodate smaller groups and day trippers too. The resort is centred on the original venue for the Conference. There is a concreted open space called Dataran Commonwealth with flagposts and a fountain. 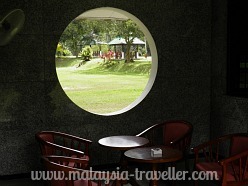 It is surrounded by neatly landscaped gardens and lakes and dotted with well maintained picnic gazebos. A picturesque stream runs alongside this area with more picnic tables. The accommodation is located in this area. There are 24 rooms (each triple sharing) in a wooden block which looks tidy and well looked after. 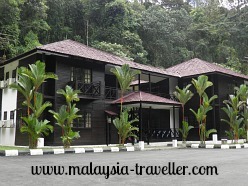 There is also a dormitory block capable of holding 4 groups of 8 guests per group. 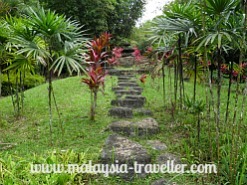 There is also a rather smart looking villa which has 2 bedrooms, a furnished living room, a kitchen and cable TV. 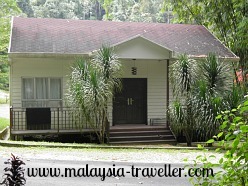 Overall the accommodation appears to be of a higher standard than that found in many forest reserve parks in Peninsular Malaysia. There is a cafeteria, Bamboo Café, which is said to serve Malaysian cuisine but was closed on the Saturday afternoon of my recent visit (Jan 2013). I imagine they open it when they have a large group staying. There is an all-purpose hall suitable for seminars, classes, etc..
Mountain Biking (bring your own bikes - they are not provided). 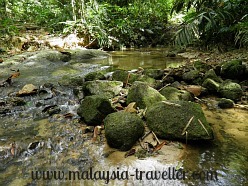 Jungle Hiking (guided for groups). Paintball (in a natural jungle setting). 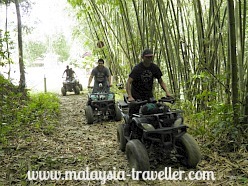 All Terrain Vehicle (ATV or Quad Bikes) trail blazing. For enquiry and rates for these activities you can contact Eiqa on 017-3280115 or email administrator@cfpresort.com . They used to have horse riding but I did not see any horses during my visit. Perhaps the horses have been replaced by the ATVs! Some of the jungle trails of the original park are now defunct. I saw the decaying entrance to the Canopy Walkway for example but this is now overgrown and out-of-bounds. 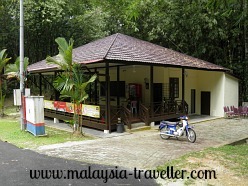 The location of the park is marked on the map on my Malaysian National Parks page. 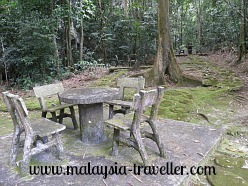 It is not easy to find this park due to lack of signage and road works. The first time I tried to go there I missed the turning which is very easy to do. Once you have missed the turning it requires a very long diversion to try again. 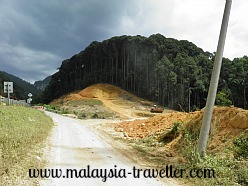 Coming from KL direction on Highway 1 towards Rawang, you will see the turn off for Kanching Recreational Forest. 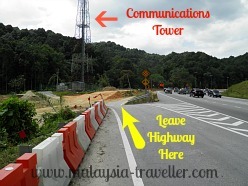 Shortly after, look out for a communications tower on your left which is where you turn off the Highway as shown in the photo. There is a major road building project going on here which has been continuing for more than a year. After the turn off you will see the park entrance pillars. Drive inside. The original park entrance is on your right. This was closed and padlocked, possibly permanently, when I visited in January 2013. 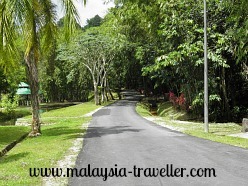 Continue straight up the narrow tarmac road and admire the tall straight trees growing here. After 5 minutes drive you will reach the main resort area where you can park your car.